Today we’ll be talking to Katie McConnell Olson, an expert in talent acquisition. She’s going to share with us the secrets of finding and developing your team members. Katie is a licensed CPA and PHR with a background in both accounting and talent acquisition. Prior to launching her own business, Katie was involved in several start-up ventures and led the search practice of a national CPA firm. Katie is a frequent speaker throughout the US. And has been quoted in a variety of industry publications on topics including hiring and developing talent. You can find her publications on LinkedIn Pulse. In 2018, Katie was a featured Sacramento DisruptHR speaker and recognized as a Sacramento Business Journal “40 under 40.” Her passions include creating businesses growth for her clients, cooking and wine. You can also see her interview in the Sacramento Business Journal here. Karla Nelson: And welcome to the People Catalyst podcast Katie. Karla Nelson: How you doing today? Katie McConnell: Excellent, excited. Not bad days, right? Karla Nelson: There’s never … well. Katie McConnell: No bad days, just learning experiences. Karla Nelson: There you go. Learning experiences, I like that. 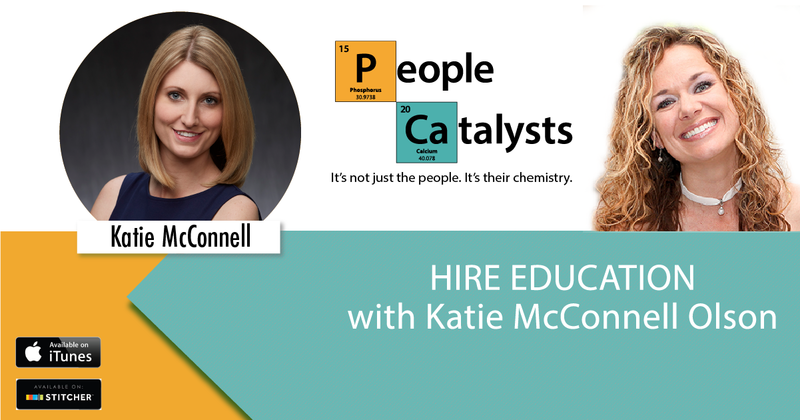 Well I’m so excited to have you on the People Catalyst podcast today Katie. You have such a unique background being a CPA, but then also working in Talent Management. It’s kind of a new area of business, right? Where we’re looking at talent and it’s really critical. It’s the most important thing in any business. Tell us your story. Katie McConnell: People always ask that “How the heck did a CPA become a hiring person, what happened?” I’m from Quincy, California, a super small town in the middle of nowhere, in the mountains, about an hour and a half between Chico and Reno. Grew up with pretty humble roots. My dad was a contractor, I’ll come back to that later. But essentially, kinda said “I gotta get out of town ’cause there’s really nothing for me here.” So I moved to Sacramento, ended up landing in accounting, in public accounting where I was auditing, go figure, contracting companies and manufacturing companies. Karla Nelson: Oh, that’s what you audited. Katie McConnell: So always had a passion for building, watching things be built and creating things. From there, I got my CPA license and I took kind of a traditional route in public accounting where I was auditing company financial statements and mostly publicly traded companies outside of the area. Ended up launching a CPA firm with a few partners and ran that for a few years. I had another startup in tandem to that, but didn’t stay started, as they sometimes don’t and ultimately ended up at a recruiting firm. I said ” I need a job.” And that started the checkerboard of my journey where I jumped from one track over to the next and became a recruiter. Katie McConnell: So, that was an interesting shift. Karla Nelson: That is. Well, when you said auditor, I just wanted to fall out of my chair. Even as a CPA, you could still do parts of the work that are kind of building or strategic, as you’re an auditor, you’re really getting into the details. Katie McConnell: You are for the first couple of years and then the ladder part, once you move up the ranks of it, you’re really working with clients business development. You’re looking at business strategy as far as what’s going wrong, here’s what I saw that you could do better from a financial standpoint. So that really translated well over into where I am now, by way of hopscotching through a few other companies in the meantime. I ended up as a recruiter and I thought “Okay, this will be a temporary thing. It will teach me how to cold call” ’cause I didn’t really know how to do that. Everything I learned, I learned from relationship selling from the CPA world. CPA’s don’t cold call. I thought “Eventually, I’ll just find the right opportunity in accounting and I’ll place myself at a job and it will be a win win for everybody. Come to find out, I really love being able to help people improve their life. This magic of hiring that I can call someone and say “I can get you closer to home” or “I have a job that you can make more money.” Whatever frustration point you have, where you don’t like your job. You and I were talking before about 70% of people don’t like their job. Well how cool is it that I can help reduce that statistic. So I love that and ultimately started working mostly, surprise, with CPA firms, helping with their hiring because I really understood the role. From there, I was recruited into a CPA firm that audited, go figure, construction companies. I led their accounts recruiting. So I built out their recruiting strategy, internship strategy. We went through a couple mergers and acquisitions and acquired a few smaller firms, but lots of great experience. Trust me, I feel like there’s something there. Fast forward a few years, I’ve now stepped out of my internal role and there’s someone else that I had hired to take my place. I’m running my practice with the firm, I’m helping all kinds of clients, we’re building this big book of business. I have a couple people on my team. The company was acquired and ultimately went in a different direction than I did and decided to step out of that business and take my company, stand alone and here we are today. Karla Nelson: Wow, what a journey. That’s awesome. I love what you said there and that’s Gallup that says that, 70% of people. This is hate their jobs actually. You can make that a larger number if you include the “Don’t likes”. Karla Nelson: How sad is that? The number one cost to any business is a bad hire or turnover. That’s not even touching the intangibles and why is that? Why do we call somebody a bad hire? Are they really, or have they not been utilized or why is there turnover? Is that a part of what the company is doing internally, or is it a part of who you brought on the team? It’s a really … a matrix that you’re working through there. What are some of the tips that you give your clients or work through when you’re looking at supporting business and their hiring practices? Katie McConnell: Sure. We start usually with the complaints. Usually, when we get called in, it’s that there’s something wrong, or they think there’s something wrong, the client. It might be people don’t stay. We can’t seem to get people to stay. Or the complaint is, there’s no loyalty anymore. These young kids just don’t want to stay. Okay, well is that really the problem? Is it everybody else or maybe let’s look internally. Why aren’t they staying? Is it because we’re not providing them opportunity? Maybe that’s why. They’re leaving because their going other places. Or maybe it’s because we don’t have a good screening process and we’re not hiring the right people to begin with. We’re settling because we’re having a scarcity mindset or we just don’t know the right kind of questions to ask and we go based on whether we think they’re a nice person, which is great and all, but doesn’t really translate into business means all the time. Sometimes we get it right and we get it right enough that this is the way we’ve been doing this for a really long time, but at the end of the day, is it really most effective for our business? Then, taking a step back from there is “Well, what are we really even looking for?” A lot of times, I think we find that clients aren’t really sure exactly what that looks like and it’s not clearly defined and then everything going forward from there is just gonna be a little bit not aligned, right? Katie McConnell: Right. The first problem, where we start usually is with the question “What’s the problem that you’re trying to solve?” Typically, when I’m trying to consult around “Hey, we need to hire somebody.” It’s “What’s the problem we’re trying to solve?” If it’s we don’t have good financial data, okay that can maybe necessitate what level of accounting personnel we need. Or if the problem is “Hey, we have steel laborers that just don’t show up on time, that are unreliable.” Alright, then we’re looking for work ethic. That’s our number one non-negotiable is people that can pass a drug test, show up on time and put in hard work. That really has nothing to do with the checklist of prior experience and everything to do with integrity and work ethic. Karla Nelson: I love that, because the object … I always say this, the object of the exercise, especially you talk about culture, you talk about talent management or whatnot. To get something done, that’s business. That’s how it correlates to business. We’re sitting in a room because we have something and sometime of work to get done, so I like how you say work ethic. Katie McConnell: Because it works. Katie McConnell: Well yeah, you can’t buy an elliptical machine and put it in your garage and hang your clothes off of it and expect to get in shape. Karla Nelson: Come on, I want to work out by osmosis. Katie McConnell: Not that I’m speaking from personal experience. Karla Nelson: Yeah, no kidding. No kidding. Well you brought up something else and there is this study and I don’t think this one was Gallop, I looked at it about a year ago when we were working with a client and they were having challenges with their millennials. They just could not hire millennials in this position and I was just curious why I happened to just be in the room because we were training their team that was already on board and employed. The millennials now, after they graduate, they think they’re gonna kinda put their debt on the universe really quickly because they’ve seen the Mark Zuckerbergs of the world. They’ve seen Jeff Bezos, which by the way, we work with Jeff, it took him 19 years to do that. He lost money forever and now he’s the richest man in the world. Everybody thinks he’s … literally, he was like a 17 year overnight success. Or something like that. It’s three months, first two months they’re engaged and then they become disengaged. And at 18 months, they’re looking for a new position because they’re so unhappy. But look at that time of productivity that they’re just trying to get by because they know that they want to go someplace else. How have you worked with your clients with this new … millennials are different. They do think that they can change, which guess what, it’s a lot easier to do it today then it ever was since the beginning of time. Also, it seems like they, which in the past, they want to learn about a lot of different things. They want to be educated. They want to be challenged and they don’t want to do the same thing. They don’t want to be in the same position for 20, 25 years and then I retire and … how do you work with your clients in dealing with that, the unique group that is in the workplace today? Katie McConnell: It totally depends on the client. We go back to right people, right seat context. We have to have the right people, but even if we have the right people, if they’re sitting in the wrong seat, then we’re gonna have a malalignment as well. Evaluating okay, does that mean that we have the right people, but we need to do for example, a tour of duty like they do internally at LinkedIn, where we give people opportunities in different departments? Or is what’s important to have them on a growth trajectory? Young people that are new in their career, not just millennials, but even veterans that are entering their careers later stage in life for the first time. Growth trajectory is something that’s important to them, they’re not gonna stay if they don’t have a growth plan laid out for them. That’s not just a millennial problem, that’s a career path problem of wherever somebody is in their life cycle, it just so happens that the younger folks are looking for more of that and it depends on where you’re at in your life cycle. Karla Nelson: Just assuming that that’s what they want instead of asking. It’s historically, scientifically, over and over been proven that … and this is the Simon Sinek “Start With Why”. People will work for less with their blood, sweat and tears if you give them a purpose and they’re in alignment with what your business is doing and what you’re company is doing. How do you work and ensure that there is that alignment, ’cause I know you’re a Simon Sinek fan as well. For those listening, we did interview co-founder, David Nieves, you can go back and listen to that podcast. How do you … because I think a lot of times when people just want a job, they might not pick the one that’s best suited for who they are. How do you work to align those two between the potential employees that they’re going to hire and then also what the company stands for? Katie McConnell: Recruitment is a sales cycle. We’re constantly selling. You’re selling … the candidate is selling themselves to the company and then the company has to turn around and sell themselves back to the candidate and find a mutual match there. I always tell clients, if a candidate is just looking for a job and not necessarily a career, they may be less discriminating and just “Okay, they’re willing to hire me, let’s go for it.” Well the onus is really on the company to say, “Okay, let’s close this process down. What are your motivations? What are you really looking for?” Let’s benchmark this process, not to rush a hire. I always say on the client side “Let’s not rush a hire. We’re not gonna do this real quick. Are you sure? Let’s have one more person. I wan to interview one more person.” Just to benchmark and make sure that we’re making the right choice and we’re not making choices out of scarcity. Which in this market is tough because you hear all the time, especially in the construction and trade, “Hey, there’s not enough skilled labor to go around. They’re going to San Francisco for a couple more bucks an hour. It’s hard to keep people in Sacramento right now.” Outside of growth, it’s just about opportunity and dollars for some of those roles. Unfortunately, it’s tough to keep people so as soon as they find someone, they think “Oh my gosh, we should hire them because they want to work here.” Now it’s up to you. Flip the tables, you’ve got somebody that has many, many options. Then, you’re kin of taking a different approach to your sales process and the recruitment cycle. Katie McConnell: Figure it out. We call it success metrics or roadmap that gets developed as part of the initial process prior to ever finding people. If we found people that we have sitting across the table and we’re extending an offer and we don’t know what success looks like for them, we’re in trouble. So it helps to have a roadmap ahead of time that “This is really what we’re looking for. These are the core confidences of the role and this is what success looks like in this role in the first week, in the first 30 days, in the first six months. These are what our expectations are” so that the company can sit back down with the newly hired employee and say “Alright, how are we talking against these things?” The employee has a roadmap as well. Karla Nelson: I love that. I think retention would go up so many times over again, if there was just … when companies take that time to really invest in the person and then also what happens is, I like what you say there Katie, that happens, “No we just shunned and stop talking to them, so they should know that they’re doing a bad job.” That’s like the worst thing you could ever do at that point. Katie McConnell: Right? Then what happens? They check out, they quit and the go replicate it down the street at the next guy, right? Guess what, sometimes you’re that next guy. Then, you’re gonna be frustrated because somebody else did you a disservice by not having that conversation and you ended up with that candidate. It’s this vicious cycle that repeats in the marketplace all over. I’m gonna keep fighting the good fight Karla, that we tell people whether or not they’re performing or not and try to help them. I’m a proponent of firing when firing should happen. If there’s an impropriety, if there’s an ethical issue, 100% non-negotiable or if it’s really just not a fit, but if we do our foundational legwork ahead of time and then we really try to set people up for success, I think we could solve some of the “problems” that we don’t have loyalty and nobody wants to stay and some of those things. Karla Nelson: It’s so easy to go with blame but you know what, the truth of the matter is, this is deeming, so we’re talking about one of the all time leaders of business that said he did a study and at first, he said that 94% of all failure is process failure, not people failure. As he continued his study, he actually ended up with … he adjusted the metric and said 97% of failure is process failure, but isn’t it funny that the first thing we do is point the finger at somebody and it goes to blame versus what’s the process? What happened? What led up to this point? Then, not blaming but just adjusting the process. Katie McConnell: Absolutely and that’s exactly what my company does is we look at that hiring process. If we can get the cycle and the process right, then we’re much better off with the inputs and making sure that we generate good outputs. Inputs being candidates and hiring process. We go back to millennials. I think young people especially, really want that feedback loop. We hear that all the time. If we’re not giving them feedback and they don’t know whether or not they’re performing, they’re not getting any validation and it’s very easy to go seek that somewhere else as part of the hiring process when the red carpet gets pulled out for you, you have that honeymoon period, if you will and then that declines and here we are all over again, we see this 18 months switch, 18 month switch. Typically, that’s not because the candidate is a job hopper as much as it is a cultural fail within the company. Karla Nelson: Yes. Oh my gosh. As you say that, it’s just … number one cost of the business, number one challenge with engagement with culture, all these buzz words, which by the way, in the last 50 years, we’ve made zero progress with billions and billions of probably trillions spent on it, zero process. We’re still at a 70% failure rate and isn’t that interesting that 70% of people hate their obs and all of those different culture, I can’t stand these buzz words by the way, because they don’t mean anything. It comes own to the specific not, “Oh culture, we’re gonna have a potluck on Friday.” It’s like “No, culture is what you’re doing as you’re running towards the object of the exercise which is whatever the task is.” It’s not that that’s a bad thing, it’s okay to have a pinball machine or whatever else however, that’s not gonna change the way work is done. What you’re talking about is finding the right person, putting them in the right place and then putting those specific things around. Regardless if it’s the growth trajectory, regardless if it’s the feedback loop. What do we need to do in order to help this person be better at what they are, instead of brow-beat them for what they’re not as well. It might not be a right fit with all the tasks. That’s what we with our work, 100% of the work is made for 1% of the population still. We have a 19th century work strategy and we’re in the 21st century. So, it makes it really challenging for both the employee side and the employer side to be successful in that. So I’m with you, I’m gonna keep fighting the good fight too Katie, and we know how to … rework and revolutionize the way work is done. With that said, thank you so much for your time today, this has been exciting. I’ve taken a couple pages of notes here too. How can our listeners get ahold of you? Karla Nelson: Awesome Katie, we’ll make sure we keep that in the show notes as well. Thank you again, Katie.